A few days ago, my email on Outlook started to have issues. I was able to send emails just fine, but there was an issue with receiving emails. People were telling me the email they sent to me would bounce back, giving them “Mail delivery failed: returning message to sender” error. 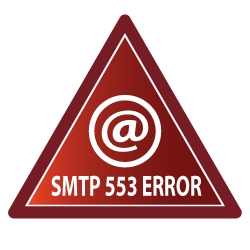 Testing it myself, it turned out that some emails were received successfully by my email client, but most of them were returned back showing that SMTP error 553. In this post, I will show you what I tried and what finally worked for me to solve this issue.